Want to become a top-level tennis player? We'll turn you into one! 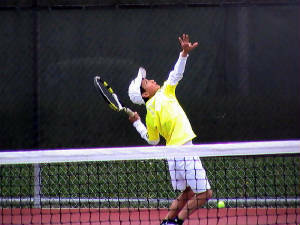 Silicon Valley Tennis Academy is the tennis school for junior players of any age or experience level. Whether you're a beginner, or on your high-school team, or a nationally ranked competitor, our tailored programs will give you the expertise to move up by many levels. Parents, this is the place where your kids can get a great start on the game! We will have your child learn the right way, improve constantly, and achieve highly. Our approach and passion for success won't just serve him or her on the tennis court, but off-court aswell. We believe the right attitude in tennis translates to the right attitude in life. How do we make this possible? We combine the intensity of our methods with an environment that recognizes the value of fun. Your kid will improve via our rigorous tutoring, and also enjoy and appreciate the journey.Our clinics are structured by means of goals set at various stages, with a learning step followed by a measurable phase of improvement. From the very first lesson, the student can identify the strides he or she will be taking. At Silicon Valley Tennis Academy (SVTA), that's how we achieve excellence. This is the reason why many of the top-ranked junior players in California have come through our program. Silicon Valley Tennis is sponsoring "The Pink Poodles" of Belmont AYSO Soccer Team in the 2013-2014 Season. It is comprised of a couple of our students who also play Soccer. Go Poodles! Thank you everybody for supporting us and wish you all a great Holiday Season! Silicon Valley Tennis Academy provides professional tennis instruction to the areas for Tennis in Palo Alto, Tennis in Redwood City, Tennis in San Carlos, Tennis in Redwood Shores, Tennis in Belmont, Tennis in San Mateo, Tennis in Burlingame, Tennis South San Francisco, Tennis Foster City, and many more tennis cities! We provide private lessons and junior tennis lessons throughout the Peninsula. 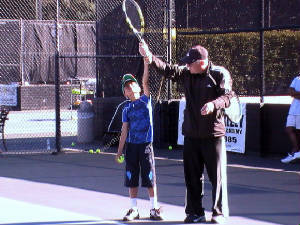 At Silicon Valley Tennis Academy, we provide the highest quality tennis coaching in the peninsula.